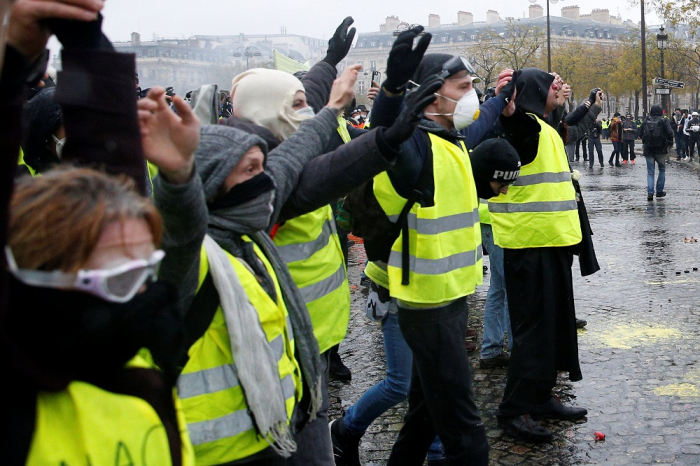 France will deploy tens of thousands of police nationwide and around 8,000 in Paris on Saturday to handle the fifth weekend of Yellow Vest protests, although the movement appears to be losing steam after concessions by President Emmanuel Macron. The chief of police in Paris said concerns remained about violent groups infiltrating the protests. Anti-riot officers will protect landmarks such as the Arc de Triomphe and prevent people getting close to the presidential palace. "We need to be prepared for worst-case scenarios," police chief Michel Delpuech told RTL radio. killed three people and wounded several others. "I'd rather have the police force doing their real job, chasing criminals and combating the terrorism threat, instead of securing roundabouts where a few thousand people keep a lot of police busy," he said. cars were overturned and torched and businesses smashed up. However, many people wearing the high-visibility motorists' safety jackets which are the symbol of the protests were manning barricades outside cities on Friday. Since the first yellow vest protests on Nov. 17, supporters have kept up a steady stream of dissent, although the numbers joining marches have steadily fallen.